On most windows installation projects that we work on, determining the replacement windows’ sizes merely requires an accurate measure of existing window openings. Our replacement windows are custom-built to fit the original openings, after all. Once in a while, though, a homeowner may want to resize their windows during remodeling. In these cases we often get asked if there are rules on choosing replacement window sizes. While there isn’t a one- and-done rule for this, the following guidelines may help you determine the appropriate window size. The International Residential Code (IRC) states that sills on operable windows should be at least 24 inches from the floor. Ideally, you should be able to see out while sitting down on a chair or on the bed. If the design calls for a much lower sill, your choices will be limited to non-operable windows like picture windows or floor-to-ceiling windows. There aren’t rules governing how tall windows should be, and in many cases, it’s a subjective design choice. Too much space between the window head and the ceiling would result in less natural light – not an ideal design if you’re planning on buying energy-efficient windows. That is, unless you’re planning on installing clerestory window to complement them. Too little space leaves little room for window treatments. Coming up with the width in relation to height is another subjective design choice, and sometimes the architectural style comes into play. For instance, continuous windows are common in modern architecture but would look out of place in traditional architecture. Grilles can also be a factor on traditional windows: grilles that are taller than they are wide generally are best, especially on wide windows. Once you have selected the right window proportion, keep it consistent across all windows in the house for a cohesive look; inconsistent window sizes are not easy on the eyes. If you’re unfamiliar with building codes, our expert consultants are well-versed with it and will tell you if your design is compliant. Set your expectations early on that the window design won’t be exactly the same as you planned it once these factors are applied. 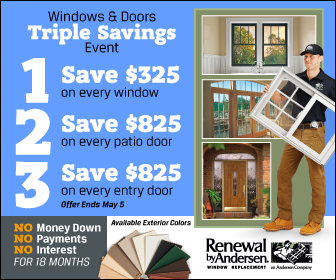 Renewal by Andersen® of St. Louis serves St Charles, MO and nearby areas. If you need help with finding the right window sizes or styles such as casement windows, call us today at (314) 332-2364 or fill out our contact form to schedule a free in-home consultation with our expert consultants.